The Society for Co-operation in Russian and Soviet Studies (SCRSS) is proud of its significant role in establishing the Soviet War Memorial in London. The Memorial commemorates the sacrifice of 27 million lives by the citizens and armed forces of the former Soviet Union in its joint struggle with the United Kingdom, the United States and France to defeat fascism during World War II. It is the only monument of its kind in the UK. The Soviet War Memorial is located in Geraldine Mary Harmsworth Park, London Borough of Southwark, adjacent to the Imperial War Museum. Since its unveiling, the SCRSS has been proactive with the Trust responsible for the Memorial in organising regular remembrance ceremonies marking Holocaust Memorial Day (27 January, the anniversary of the liberation of Auschwitz by the Red Army), Victory Day (9 May, the day on which Russia celebrates the defeat of Nazism in Europe) and Remembrance Sunday. 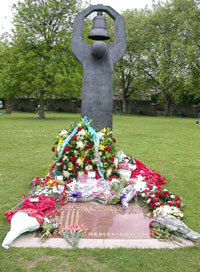 See the SCRSS Events page for details of Soviet War Memorial Trust events. Following a decision taken at an SCRSS AGM, a meeting of interested parties led to the formation of the Soviet Memorial Trust Fund (SMTF) in 1997. The SCRSS was a founder member. The SMTF was instrumental in organising the fundraising necessary to create the Memorial, as well as its official unveiling. The Soviet War Memorial was unveiled on 9 May 1999 by the British Secretary of State for Defence, the Rt Hon George Robertson MP, and HE the Russian Ambassador, Yuri Fokine, in the presence of HRH the Duke of Kent. This was a major inter-governmental event in which veterans and other organisations from Britain and the former Soviet Union participated. The Soviet War Memorial is located in Geraldine Mary Harmsworth Park, Lambeth Road, London SE1 6HZ (adjacent to the Imperial War Museum), on land donated by the London Borough of Southwark. The memorial was designed by Russian sculptor Sergei Shcherbakov. The granite memorial tablet was made by British stonemason Gary Breeze. In 2018 the SMTF was transformed into the Soviet War Memorial Trust (SWMT), a HMRC-registered charity (Reference Number EW91910). You can donate to the Trust at Virgin Money Giving. The SWMT can claim GiftAid on donations from UK taxpayers.